Estimated reading time: 2 minutes, 25 seconds. It’s December and that means it is almost time to toast the New Year. It also means that tax season is around the corner. Thinking about taxes in the midst of all the end-of-the-year festivities can seem like a bit of a buzzkill but it’s a smart thing to do! Even though you won’t have your W-2 form yet, getting some tax-related tasks completed in December can save you time, hassles and stress when the tax season really starts to kick into high gear. Tax season is around the corner. Even though you may not have your W-2 form yet, there are some tax-related tasks you can do right now. So before you sip your champagne, consider these four things you can do right now to get a head start on your 2018 tax return. A new tax plan went into effect on January 1, 2018. If you haven’t had a chance to review how those changes may affect you, now is a good time to do so. This NerdWallet article explains some of the changes which include modifications to tax brackets, tax breaks and more. Examine your last year’s tax return. Were there any areas you didn’t understand or you had trouble with? Did you miss a deadline or make a calculation error? 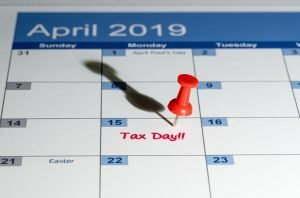 If there were issues the last time you filed your taxes, think of ways you can avoid the same problems this year, which may perhaps include reaching out to an accountant for assistance. You may not need to include the receipts with your tax return, but if you are audited, you may be asked to show proof of those expenses. Will you be filing your taxes yourself or will you be using an accountant? Keep in mind that military personnel have access to many free or discounted tax preparation and filing resources. For example, active duty service members, retirees and dependents can receive free, in-person tax preparation services through the IRS-sponsored Volunteer Income Tax Assistance (VITA) program. The program is available at many U.S. military installations around the world. Check with your local base to learn if the program will be available near you. There are also services such as TurboTax and TaxSlayer that offer service members free or discounted tax software. Active duty service members, retirees and dependents can receive free, in-person tax preparation services through the IRS-sponsored Volunteer Income Tax Assistance (VITA) program. It might be hard to focus on your taxes this time of year, but by doing a little preparation now, you’ll make the tax filing process smoother and less stressful.